Saturday I had an assignment to cover a Comic Convention in Mississippi. I was looking forward to it because I thought a place where hobbits, stormtroopers, Klingons, zombies, and comic book heroes gathered would be a very visual experience. Maybe it was my insomnia from the night before or the weather zapping everyone’s energy, but I really felt I failed on this assignment. Ironically, I was probably regarded as the most freakish person there, because I was armed with a camera and didn’t want anyone to pose for me. I walked away with something that more or less worked of a zombie family shopping for little rubber ducks dressed in human clothes, but it felt just eh, passable. My advice to shooting a comic convention, Don’t chase Klingons. Find something that’s like a bug zapper for nerds, like the sword replica booth or the Harry Potter wand replica booth, and camp out. I wish I did. I think Gandalf was running the sword booth. Next time. These are a couple images I got from the assignment. I’m not a big fan of them, but in hindsight and attaching some Wikipedia definitions, found some mild humor from them. deadpool’s dayjob, originally uploaded by lightwriter27. "Deadpool is a fictional character that appears in comic books published by Marvel Comics. 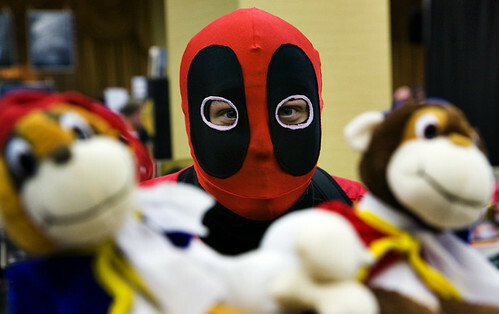 A disfigured and mentally unstable mercenary, Deadpool is famous for his tendency to break the fourth wall and is frequently referred to by the moniker ‘Merc with a Mouth.’"
And apparently sells cuddly monkeys on the side. His sales pitch could use some work. This guy wants to be taken seriously?, originally uploaded by lightwriter27. Enter myself: strolling along this comic convention, look for an interesting image. 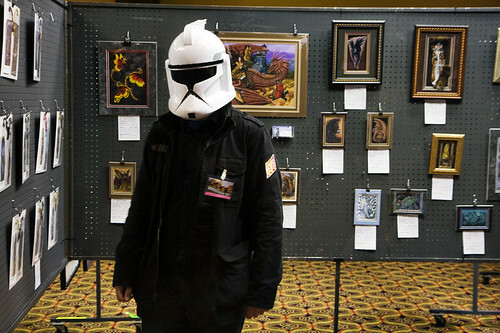 See clone trooper looking at art. Clone: [Quite seriously] um, was I in your shot. Yea. Too bad he blocked the dragon.